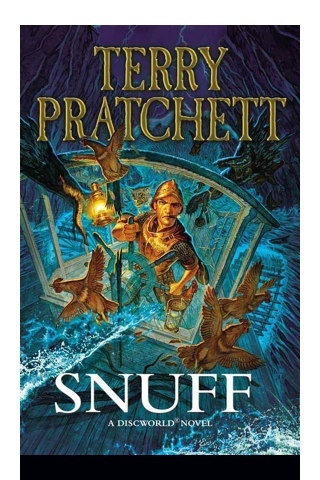 Finally got my hands on the latest Terry Pratchett novel for the DiscWorld series. Ok it’s been out since October last year but I haven’t had time to read it until today. I’m only about 60 pages into the book and it’s been an absorbing read. I’ve always loved almost any book by Pratchett and this is no exception. The last book I read was I shall wear midnight, the final book in the Tiffany Aching and Wee Free Men “trilogy”. That made me laugh till my stomach literally ached. So I have high hopes for Snuff. Ok, and I can’t keep this to myself any further because I want to gloat. I met my idol Pratchett at a book signing many years ago and I asked him politely as how a young besotted fan would while he wrote my name and some well wishes on the books I have proffered to him that if he could possibly publish more books in a year because I really can’t wait to read the next one every time I finished the latest DiscWorld novel. And now you can inhale the sweet oxygen sharply before reading further. Pratchett replied something along the lines that he would very well like to do that but writing is not easy at all. Considering that I do not know the guy personally, I thought he sounded affronted and I felt almost embarrassed to have asked such a silly question. With that, I ambled on, wondering why I couldn’t have not say anything at all if I couldn’t offer something witty or intelligent. So this memory still haunts me to this day and yet my love for Pratchett’s books remains undiminished. 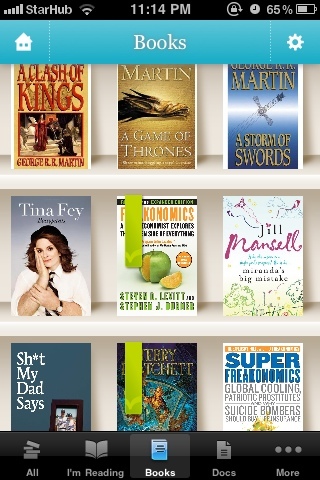 By the way, I found a new ebook reader for the iPhone. Yes, I finally discarded Stanza after the latest software update screwed up the app and rendered it completely useless. Maybe it’s Amazon’s way of telling us to get a Kindle. Which I did try to search for the Kindle iPhone reader but nothing turned up. Anyway, I couldn’t get used to iBook even though its user interface is clean, friendly and oh-so-pretty like all other Apple products. Even the free books downloaded from the store look so classy in their vintage book jackets. And I may be wrong about this but I couldn’t add external ebooks or PDFs onto the app. It only allows books that are from the store. That was a bit awkward because I was looking for a solid ebook reader for every form of online content I may have. Enter Kobo. It’s everything I want in an ebook reader and more. Clean user interface, minimalistic easy-on-the-eye design and the ability to add as many ebooks or PDFs and even newspapers or magazine subscriptions as you desire. It’s like iBook, but better and dare I say it, yes prettier. Seriously, try it for yourself. Kobo is really up to snuff.